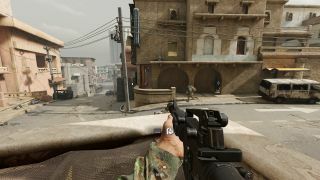 Insurgency: Sandstorm launched yesterday, and I was just about to share that fact with you when, instead, I found myself hiding behind walls, sprinting between alleys and trying not to get shot as insurgents poured into courtyards under the cover of smoke. It’s a startlingly loud shooter, especially with headphones, and extremely stressful. I rather like it so far. Sandstorm has the air of a sim without getting too bogged down in the details. It feels authentic, even though it’s as brisk as an arcade shooter. Guns are hefty, mechanical bits of kit that take a while to reload; bullets are very, very lethal; and if you die, you can only respawn when your team captures a new objective. I died three times in the tutorial alone. I could pretend it was because I was distracted by a bee, but it’s December and all the bees are dead. I just got surprised. Enemies aren’t especially smart, but they’re very adept at appearing right where you aren’t looking, which is typically fatal. They love a smoke grenade, too, and will use them to quickly surround surprised soldiers. My first mission went considerably better, backed up as I was by a large group of gun-toting chums rather than AI stand-ins. It was a brutal fight down a street-turned-warzone, surrounded by too many doorways and windows to cover. There was rarely a quiet moment, and while there were plenty of discrete, objective-based shootouts, the whole thing felt like one giant, terrifying battle. When the gunfire briefly relented, it usually meant a lot more of it was coming. Fighting to objectives was wild, trying to make sense of the streets and open buildings all while trying not to get shot. Walking up to one door, I’d barely opened it before a shotgun blast filled me with holes. It’s full of surprises. I stopped opening doors so boldly after that. Allies started dropping off but the insurgents kept coming. It was trying to protect those objectives after capturing them when things got really hairy, though. With smoke everywhere, bullets from friends and foes cutting through everyone indiscriminately and enemies pouring out of every doorway, it can devolve into a mess very quickly. It looks fine but sounds incredible. It’s extremely loud, and the explosions and bullets—the din of battle—sound unnervingly close. It’s the audio, rather than the minimalist UI, that helps you make sense of the chaos, too. It’s a very chatty game, with both allies and enemies barking updates and orders, or just reacting. Positional VOIP is helpful, but the in-game audio does a brilliant job on its own. The 8-player co-op is probably where I’ll be staying for now, but there are also 16 vs 16 PvP modes. There’s a surprising amount of cosmetic customisation, too, and it’s available right out of the gate. Both factions, Security and Insurgents, get unique clobber to wear, ranging from flashy military gear to a regular hijab. As well as clothes and accessories, you can choose your gender and a few other physical traits. Insurgency: Sandstorm is out now.